Have you ever found yourself staring at the dessert menu in a restaurant, unable to decide on just one item? It’s a true crisis at times, especially when you want to order everything you see, but clearly your waistline doesn’t agree. Your best option is to go out to eat with several people who have a weak spot for desserts so you can all share one, or everyone get something different to sample each one. Numerous times I’ve been out with people who claim they don’t want dessert, but as soon as it hits the table, they’ve eaten more than I have. How does that happen? I was caught in this exact situation while looking over the dessert menu at a small restaurant in St. Petersburg that brings their desserts in from a bakery. We ended up each getting our own dessert, rotating them around the table like it was a professional taste-testing event, nodding and making noises with each bite. I couldn’t believe the amazing flavor of white chocolate with swirled raspberry filling throughout this cheesecake and an Oreo cookie crust. We even took chunks out of my friend’s husband’s carrot cake that was so nicely packed in a to-go box. Acting as damage control, we were preventing him from feeling guilty over eating such a large piece of cake. Now that’s heartfelt consideration. In a food chopper or food processor, chop cookies into fine crumbs. In a medium bowl, mix together cookie crumbs and melted butter. Press mixture into the bottom of a 9 inch springform pan. In a small saucepan, combine raspberries, 2 tablespoons sugar, cornstarch, and water. Bring to boil, and continue boiling 5 minutes, or until sauce is thick. Strain sauce through a mesh strainer to remove seeds. Preheat oven to 325 degrees. In a microwave safe bowl, heat cream just until boiling, pour over chocolate chips in a small bowl, stirring together until chocolate is melted and mixture is smooth. Let cool. In a large bowl, mix together cream cheese and 1/2 cup sugar with electric mixer until smooth. Beat in eggs one at a time. Blend in vanilla and melted white chocolate. Pour half of batter over crust. Spoon 3 tablespoons raspberry sauce over batter. 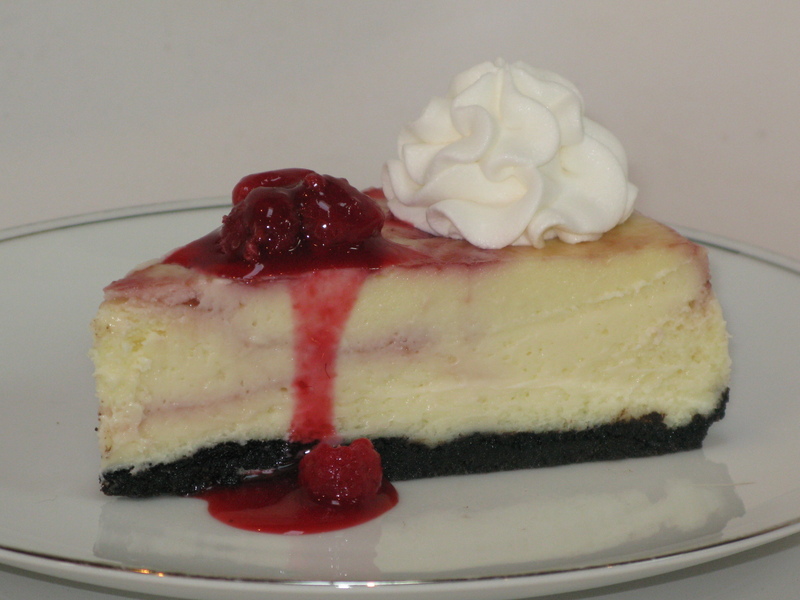 Pour remaining cheesecake batter into pan, and again spoon 3 tablespoons raspberry sauce over the top. Swirl batter with the tip of a knife to create a marbled effect. Bake for 60-70 minutes, or until filling is set. Cool, cover with plastic wrap, and refrigerate for 8 hours before removing from pan. Serve with remaining raspberry sauce and whipped topping. Store in refrigerator.